When looking for a new boiler you’ll need to consider how powerful it is and this is measured in kilowatts (kW). Likewise, if you’re casting an eye over your energy bill then you’ll come across kWh, which is a measure of how much energy is being used in your home. All of these acronyms and technical terms can get a bit confusing so we’ve put this guide together to help give you a clearer understanding. As you might have guessed from the above heading, kW is short for kilowatt, a measure of power made up of 1,000 watts. Watts measure energy in relation to time so a boiler with a maximum output of 24kW will produce 24,000 joules of energy per second when in operation; this energy will heat water for your home. The higher the kW rating of a boiler, the more radiators and taps it can supply at one time. You’ll see this term when looking for a brand new boiler as it shows just how powerful the unit will be and, depending on the heating demands of your home, a different kilowatt may be more suitable. While a kW is a measurement of power, a kilowatt hour (kWh) measures just how much energy is being used. So, if you have a 24 kW boiler, it will require 24 kWh of energy for each hour that it’s working hard to heat your home, if it’s operating for 2 hours then it will be 48 kWh and so on. You’ll most probably spot this on your energy bill as it’s used by suppliers to calculate the total cost. Should you receive a bill that’s higher than you expected, you can work out ways to use your appliances more efficiently. 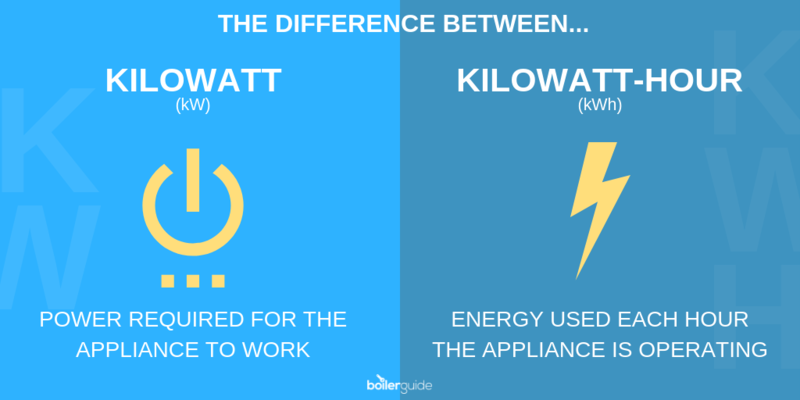 What’s the Difference Between kW and kWh? Understanding kW and kWh can help you to know how much energy each appliance in your home is using and become more conscious of the energy being used, which could help you to lower your energy bills. What can 1 kWh Power? So, it can all add up, which is why knowing the difference between kilowatts and kilowatt-hours is important. kWh can be calculated from kilowatts and the number of hours the appliance has been in operation. With the energy being equal to the power times the period of time or, to put it scientifically: E (kWh) = P(kW) x t (hours). Once you know what kWh represents, the next thing you’ll want to know is how that compares to average usage and whether you can use this information to lower your energy bills. In the UK, when it comes to gas, anything above 18,000 kWh per year is considered high, while below 8,000 kWh per year is low consumption. The average home will tend to use 33-38 kWh each day. Electricity consumption per year is thought of as high when it passes over 4,600 kWh, with the average household using 8.5 – 10 kWh per day. There’s no boiler sizing rule of thumb that shows the exact size of boiler your home will need depending on the number of bedrooms and bathrooms, but you can get an idea of the boiler size you need. The output of domestic boilers tends to range from 24kW to 42kW and you’ll need to pick the right size as too small and your home won’t be well heated while too large could increase your energy bills. You can use the table below to help you find a suitable output for your home depending on the number of bedrooms, bathrooms and radiators you have in your home. If you’re still not sure about which size of boiler is best for your home, then it’s best to ask an installer. You can get free quotes from up to 3 trusted installers in your area by filling in one of our simple online forms today.